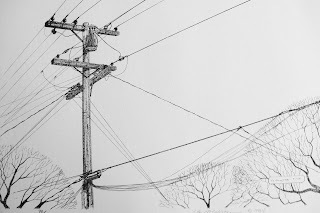 The Bird on the Wire [right] and The Telephone Pole [below] are large pen and ink drawings using Rapidograph drafting pens. 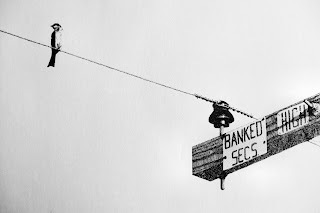 The Bird on the Wire was drawn from a photograph that I took and the Telephone Pole was drawn from life. The drawings were then made into full size limited edition numbered prints of 100 each in 1984. I rediscovered these prints recently during a move. Of those not sold before they were stored, a few were damaged. So, the total number of salable prints is less than a hundred. I've offered these for sale on Ebay. They were designed to be a set but they can be purchased separately. Each is signed and numbered by the artist. The unframed black and white prints are presented on 17.5" X 22.5" heavy textured paper and are faithful to the original drawings. The Bird on the Wire is $35.00 and the Telephone Pole is $20.00. The set can be purchased for $50.00. Shipping is extra.